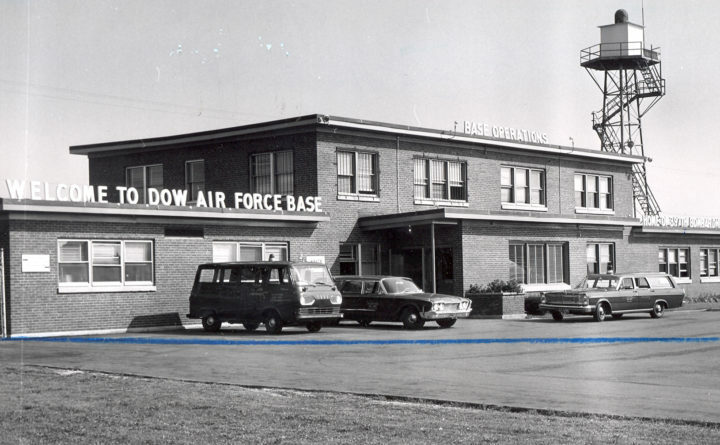 This BDN photograph of the Dow AFB Base Operations building appeared in the Bangor Daily News on Sept. 23, 1965. On the morning of Friday, April 5, 1968, the last two planes to ever take off from Dow Air Force Base in Bangor left the runway. The City of Bangor, a B-52, and the City of Brewer, a KC-135, flew away from the base, and as they reached the Penobscot River, the pilots of both planes dipped their wings, in a symbolic gesture, saluting the city that had been the base’s home for nearly 20 years. As of that morning, Dow Air Force Base was officially closed. Fifty years later, Bangor is a totally different place in many respects. But the legacy of the base lives on in a number of ways, both physical and cultural. Buildings once used for many purposes on the base now house the Bangor campus of the University of Maine at Augusta. The Maine Air National Guard is still proudly stationed in Bangor. In perhaps the most visible example, Bangor International Airport continues to grow and provide a connection to the rest of the country and the world. Here’s a brief history of Dow’s impact on the city and region, from the 1940s until the base’s final days in 1968.